Practitioner toolkits have become the hallmark of the What Works Network. They allow frontline workers to compare the effectiveness of different practices and programmes. But what’s it like to create one of these resources? What challenges do What Works Centres face in deciding how best to communicate the state of the existing evidence base? Following the recent launch of the What Works Centre for Children’s Social Care’s Evidence Store, we asked the project lead, Louise Bazalgette, to share her experience. Our conversations with children’s social workers across England show a clear enthusiasm for evidence-informed practice. However, the barriers to them accessing research evidence are often high. For a start, there is not enough high-quality evidence about ‘what works’ in children’s social care. And for practitioners at every level there are challenges in finding and interpreting evidence to inform their work. The most robust research evidence is often hidden behind the paywalls of academic journals and is often not written in a way that makes it easily usable by busy professionals. 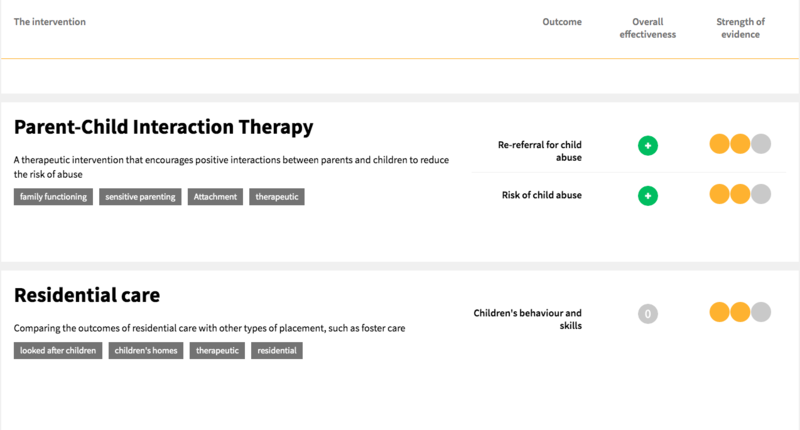 So, having joined the What Works Centre for Children’s Social Care in January 2018, one of my first tasks was to create a user-friendly platform for sharing research evidence with children’s social workers. I was lucky to be able to draw on the work of other What Works Centres. They have developed evidence toolkits in areas such as education, crime, homelessness and early intervention. Learning from these colleagues, we knew that it would be important to work with children’s social workers throughout our design process. This would ensure that the product we created would feel relevant and useful. If it did not deliver the information they needed in a clear and accessible way, it would simply not get used. At a series of events with social work leaders and practitioners in early 2018 we learned that context matters. People did not just want to know ‘does it work’ but also ‘will it work here, with our families?’ We needed to adopt a framework – or ‘standards of evidence’ – to help us communicate what effective practice looks like and how much confidence we have in the existing evidence. These priorities led us to the EMMIE framework, developed by the UCL Jill Dando Institute for use by the What Works Centre for Crime Reduction. Unlike some other sectors like education or health, the evidence base about ‘what works’ in children’s social care is still at a fairly early stage. There are not a large number of robust studies to draw on. So we decided to start by sharing evidence from published systematic reviews, which pool findings from groups of smaller studies, to show whether or not an intervention or practice approach tends to have a positive effect on outcomes. Our research partners, CASCADE at Cardiff University, identified published systematic reviews and we consulted our practitioner panel to check that these felt relevant to their work. Our colleagues at CASCADE devised rating scales that could be applied consistently to the evidence base for each social care intervention. As there is a limited amount of causal evidence in children’s social care, we decided to include categories for both very low strength evidence (where there are no acceptable quality published studies) and low strength evidence, where there are only one or two acceptable quality studies. This felt like an important distinction so that we were not setting the bar so high that it would send a discouraging message to the sector. In May 2018 we began the process of designing our Evidence Store – a platform for sharing evidence with children’s social workers. Futuregov led the design, working in partnership with two local authorities (West Sussex and Coventry). Their senior social work leaders and practitioners advised us on every aspect of the design, including the information and functionality they wanted and the language and visual design that most helped their understanding. Futuregov mocked up website layouts and brought them to social workers in West Sussex and Coventry for their feedback. This design process led to us giving prominence to three categories of information in our design: (1) the outcomes that interventions were trying to influence, (2) the evidence of their effectiveness, and (3) the strength of that evidence. An additional category highlighting cost could be added later when more research about the cost-benefit of interventions becomes available. We launched our Evidence Store in January 2019, initially providing plain English evidence summaries about eleven interventions and highlighting additional topics that would be ‘coming soon’. We plan to broaden its remit to include single studies so that we can also share a more emergent evidence base about ‘what works’, including the results from our own research projects. We also have an ongoing programme of work in partnership with local authorities to support them to become evidence-ready organisations. Through this work we hope to enable the children’s social care sector to take ownership of its shared evidence-base – freely available for all to use. This blog was first published on the Gov.uk website.